For fashion brands, participation in the Bangladesh fire and safety plan is voluntarily. It shouldn’t be. This week has been a waiting game for consumers, as we’ve followed news of fashion brands that source from Bangladesh to see how they respond to the late-April collapse of the Rana Plaza factory where, to date, more than 1,100 garment workers have perished. Clothing companies and labor groups have been busy etching out a rigorous fire and safety agreement, which establishes independent inspections of the country’s factories, is legally binding, and requires that improvements in building safety be partially funded by fashion brands. As the story has unfolded, it’s highlighted an underlying problem with corporate responsibility, particularly in the United States: Whether brands participate in the Bangladeshi factory safety agreement is totally voluntary. And embarrassingly and dishearteningly, it’s been the US clothing giants that have been reluctant to sign on. European companies, including H&M, Tesco, Primark, Benetton, Mango and others rapidly signed on earlier this week. 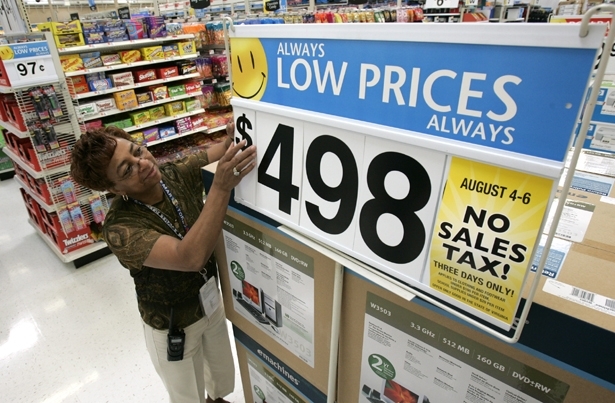 Walmart has decided to develop its own plan for inspecting its Bangladeshi suppliers. This, even after it was revealed that the retail giant sold jeans from a supplier that had placed an order in Rana Plaza. It’s response was to fire the supplier, Fame Jeans. Sears has also decided to go its own way. As of this morning, Target has declined to comment on the agreement and J.C. Penney is still reviewing the plan. One potential bright spot: Gap, which owns Old Navy and Banana Republic, is expected to sign on in the coming days. One justification provided for the split between European and American retailers is that, according to a Gap spokesperson, America is overly “litigious.” In other words, this agreement might actually provide the necessary threat to brands for an agreement like this to work. In 2009, the Ninth US Circuit of Appeals ruled that workers in foreign factories that supply Walmart can’t hold the company responsible for their workplace conditions, despite the retailer’s code of conduct that’s supposed to hold its contractors to decent labor standards. This lack of liability is enjoyed by every retailer that uses contracted factories, which they do not own. It’s this loophole, the one that legally distances clothing companies from the very people who actually make the clothing, that has consistently and historically wrought disaster and human tragedy. Given the labor-intensive and highly competitive nature of the fashion industry, it has long needed tighter regulations and now is the time to push them through. The workers in sub-contracted garment factories need crucial protections. Currently, the United States government and our courts are doing nothing to police fashion companies’ behavior in factories overseas. The Rana Plaza disaster is a matter of international concern, and the time is ripe for government leaders to step in, evaluate the situation and force the hand of business. Otherwise, clothing brands will continue to distance themselves from tragedies, tragedies will continue to happen and consumers will feel confused and hopeless about their role in all of this. In a new survey, 84 percent of New York's fast food workers report having their wages stolen. Read Josh Eidelson's report.